The approach regarding the “Visual Comparison of Networks”, that occupational group of visualization experts describe in the section Tools and Demos, was accepted for presentation at the PacificVis conference (April 23-26 in Bangkok). This approach allows for the analysis of the evolution that a narrative text’s characters and their relationships take over the course of a storyline. To this end, a series of graphs that represent the character constellations in several different passages of the text can be displayed in several visual forms and thus be compared with each other. 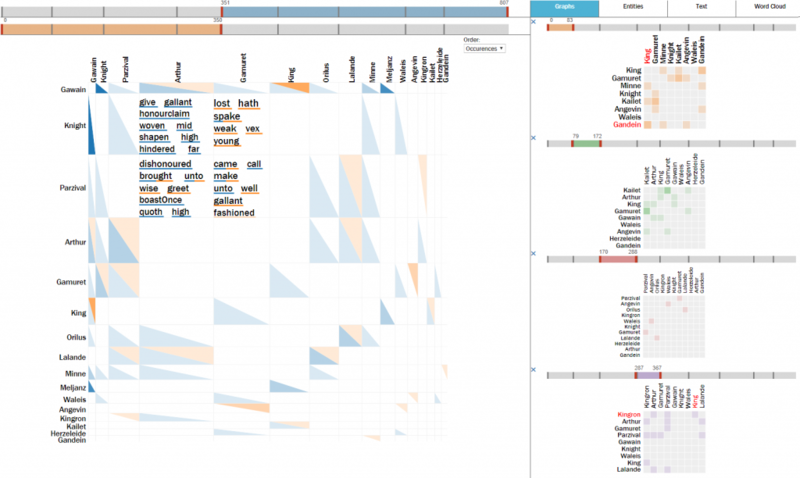 The text passages in turn are interleaved with these visualizations, which allows for the consideration of the characters’ denominations within the respective immediate context. The characters’ relationships can be further characterized by means of a summary of this context. 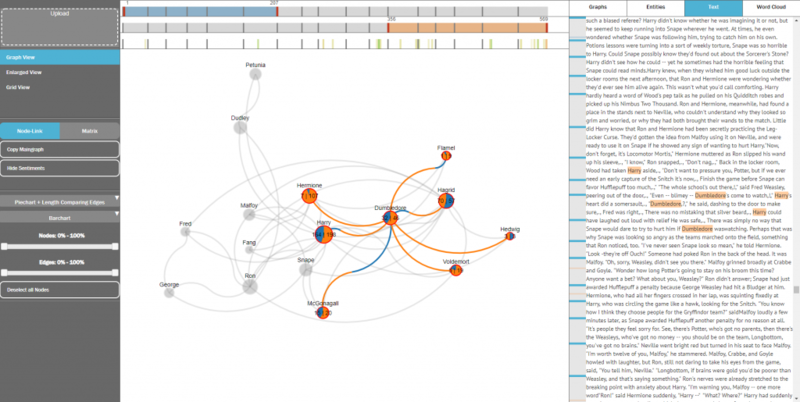 In the case of large and multiply interconnected character sets, analysts can interact with the visualizations in order to filter and focus the elements of the graph in such a way, that the partial structures that are of interest become evident. Correction of mistakes resulting from the automatic character extraction. Quick apprehension of a character’s characteristics and of its function in the storyline’s complex of actions. Identification of groups of characters that appear predominantly within one of the selected passages and of central “bridge characters” who connect these groups. Characterization of relationships that central characters maintain with the others. Verification of the hypothesis that the character graph changes substantially over the course of a series of text passages. Verification of the hypothesis that these successive constellations are only interconnected by a few central characters. The article by Markus John, Martin Baumann, David Schuetz, Steffen Koch, and Thomas Ertl will appear at PacificVis titled „A Visual Approach for the Comparative Analysis of Character Networks in Narrative Texts“.